The Department of Communication Sciences and Disorders in Samford University’s School of Health Professions hosted its annual Above and Beyond Award Ceremony to honor students in the department’s undergraduate and graduate programs who have demonstrated academic and clinical excellence, leadership and commitment to service over the past year. Kandis Chatman, president of the Speech and Hearing Association of Alabama, served as the program’s keynote speaker. In her address, she reminded students that speech language pathology and audiology is more than a job. It’s a calling. The department distributed a number of awards during the ceremony. Twenty undergraduate students received medals for academic excellence in maintaining a cumulative GPA of a 3.75 to 4.0. Additionally, three graduate students received a certificate for academic excellence for maintaining a 4.0 during their graduate studies. Thirteen undergraduate students also received certificates, honoring them for achieving a cumulative GPA of 3.5 to 3.74. In addition to honoring academic achievement, several awards were given in honor of students’ commitment to leadership and service. Nikki Devenny, a junior communication sciences and disorders major, was the recipient of the Undergraduate Leadership Award for her exceptional ability as a servant leader. The Graduate Clinical Service Awards, which were chosen by the department’s faculty and clinical preceptors, were awarded to second year Master of Science in speech language pathology students, Cameron Carter and Rebekah Waldrum, and first year Master of Science in speech language pathology students, Emily Harrison and Mary Allison Tyner. 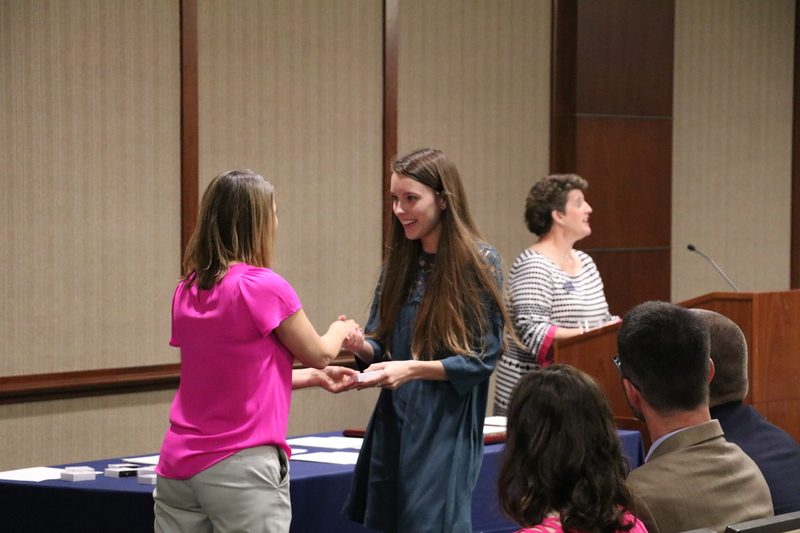 The department offers one last award which is called the Samford Spirit of SLP award to a second year graduate student. Maegan Pierce was chosen by her peers to be this year’s recipient of the award, honoring her ability to exemplify the department’s core values: faith, excellence, integrity, learning, teamwork and service.